Enchanting, magical and enjoyable, Disney’s Beauty and the Beast is a stunning achievement in animation and emotive storytelling that will appeal to all the family. No matter how old you get, the story is still an involving and touching fable. In the prologue, we learn of a handsome but supremely selfish prince who turned away an old beggar woman offering him a rose in return for shelter. She was in fact an enchantress who transformed him into a hideous beast and turned his servants into animated objects. The curse could be broken if he gained the love of a woman before the last petal fell from the enchanted rose she offered him, if not he will remain a beast forever. Years later in 18th Century France, Belle is a smart and strong-willed young woman living with her inventor father. Belle is beautiful but a nonconformist who prefers the company of her books and yearning for adventure rather than the many advances of the self-obsessed hunter Gaston. Belle’s father Maurice travels through the forest but loses his way. He stumbles upon the Beast’s castle and is imprisoned by the master in the dungeon. Belle later comes to his rescue and bravely sacrifices her freedom so that her father can be released. She is given company by the animated house objects: the rebellious candlestick Lumière, the tightly wound and loyal clock Cogsworth and the motherly teapot Mrs Potts. Initially distant from the Beast, Belle slowly begins to understand him and the two tentatively fall in love, with Belle seeing passed the scary exterior and connecting with the wounded soul beneath. But what will happen when Gaston becomes aware of this? And can Belle’s love for the Beast break the spell? Magical animation, stunning musical numbers and splendid voice work give Beauty and the Beast a lovely elegance that can be treasured. The animation is truly magnificent and ambitious in equal measure, really making the gloomy world of the castle come alive with colours. Stunning imagery is ever-present such as the splendid ballroom which the Beast and Belle dance in and the snow-covered entrance to the castle. The screenplay excellently shows us the romance between Belle and the Beast, yet also manages to cover the deep theme of accepting others for who they are and that beauty lies within a person. The film soars in the musical numbers that are still as catchy as they were all those years ago. The opening number ‘Belle’ provides a humorous introduction to the eponymous beauty as the villagers discuss how she doesn’t fit in with their society. ‘Gaston’ is a tongue in cheek song about the self-obsessed brute who has Belle firmly in his sights. The main show stopping number is ‘Be Our Guest’ sung by the objects of the castle in an attempt to cheer her up. Taking cues from broadway and old movies, the number is full of dancing plates, sweeping dusters and joyful love that is impossible not to sing along with. And who can forget the haunting title song sung with wise assurance by the incomparable Angela Lansbury? The voice cast are perfectly suited to their roles and imbue them with dexterity and flair. Paige O’Hara splendidly combines strength and touching bravery as Belle. Her singing voice is a marvel as well, singing with clarity and loving kindness. 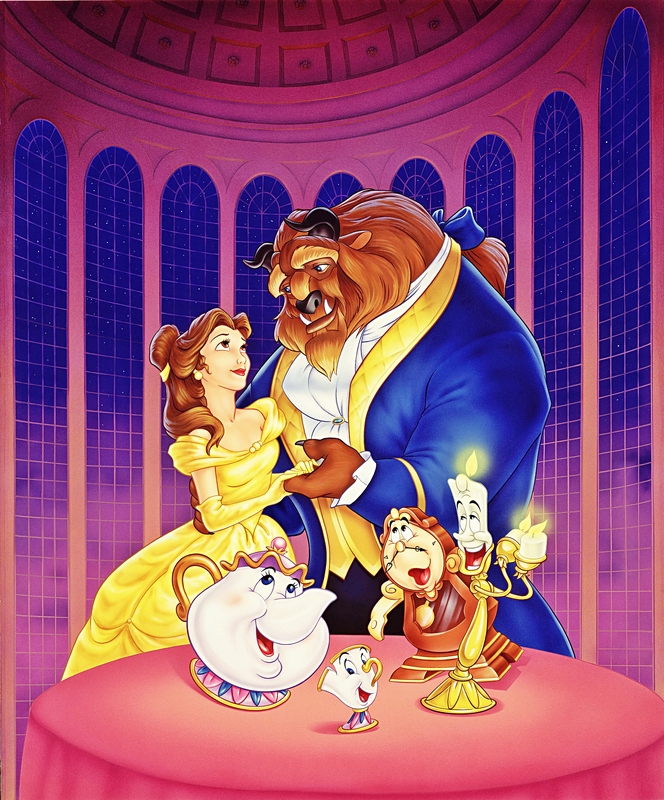 Robby Benson’s deep but engaging voice is ideally suited to the Beast, and gives him depth and mournful sorrow that subsides into happiness as he develops feelings for Belle. Richard White provides arrogance and unnerving intensity as the selfish Gaston. Jerry Orbach excellently lends his vocal talents to the role of Lumière, the funny and lovable candlestick who often finds himself in trouble. David Ogden Stiers effortlessly voices the rigid and regimented Cogsworth, who clashes with Lumière over various issues. And Angela Lansbury deserves praise for her warm delivery as Mrs Potts. Joyous, emotionally involving and full of dazzling animation, Beauty and the Beast is a film that will never get old.